I NEED TO WATCH THIS NOW! HODGE AND SIMON ARE PERFECT! I watched this the moment it came out, but seeing as how I had to get back to studying because of the monumental amount of tests I had the next day, I couldn't post my response. But alas, here it is in the form of gifs and valley girl words! At first I was all OMG THIS IS GOING TO BE AMAZING. 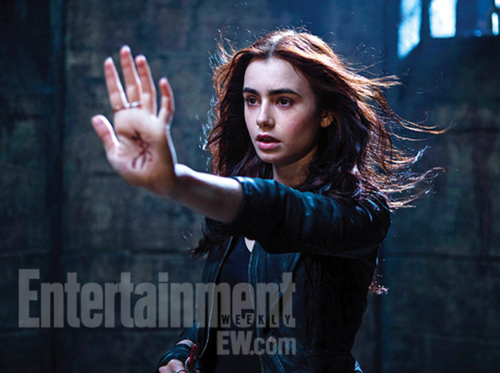 But then Jace SPOKE and Clary put out her hand. And I was all like WHAT? MUDAAAANNNNEEE? I knew they were going to have British accents, but SERIOUSLY?! Jace just sounds weird. I know once I see that he's still the Jace I love, cocky jerk and all, then I'll be happy. But for now all I have left is watching and rewatching the trailer as my friends console me. So yeah. WATCH THE TRAILER AND BE AMAZED. Can you believe I still haven't read the book to this yet?